Tony Lawrence's Coins & Stuff: Grading and authentication: PCGS or NGC? 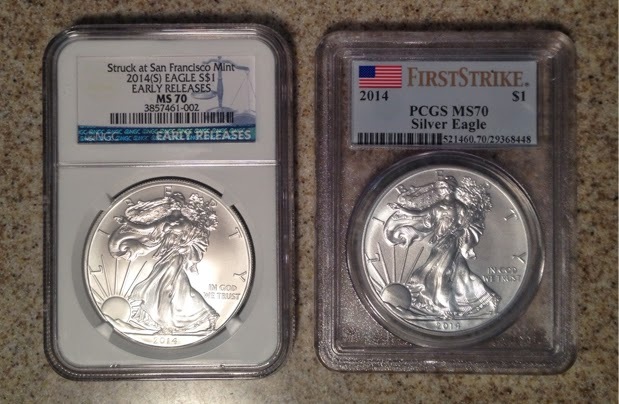 Most people will tell you that PCGS is better than NGC when buying authenticated coins. There are some who will dismiss that, but even they have to agree that the market speaks loudly: a PCGS MS70 coin will almost always sell for more money than the same coin graded MS70 by NGC. Supposedly this is because NGC is too liberal. The difference (if it exists at all), isn't much and most of us would be hard pressed to discern an MS69 from an MS70 anyway, but in many cases a one point difference in grade can be very significant, with the higher grade selling for hundreds of times more than the lower. The perception that NGC is too liberal means that those price discrepancies affect NGC prices: an NGC MS70 might only command PCGS MS69 prices. It should be noted that there are those who will buy NGC because they believe such differences are too minute to matter and that the NGC is therefore a better value. If they are not buying with any investment goal in mind, they may be right. I personally have a bias toward PCGS. I don't absolutely agree with the "NGC is too liberal" concept, but I do agree that it is perception and that perception affects value. Should I ever want to sell, that perception will work in my favor. Some will insist that it is more than perception. They might point to population reports and show that NGC will have more higher grade coins. But that doesn't necessarily mean that they are more liberal. It could also mean that PCGS is too strict and is degrading perfectly good coins for near microscopic imperfections that truly don't matter. Stories of people getting increased grades by cracking and resubmitting could lend credence to that theory. Or, it might be NGC that gets large numbers of regrades, which could inflate their numbers. NGC has less expensive submission fees, so that might cause more resubmissions. Someday, someone will do a rigorous double blind study. That would obviously be expensive and time consuming and have a large margin of error, but it just might show that the differences are less than assumed or even non-existent. My original bias toward PCGS came about more by accident than design. I had a single PCGS "box-o-twenty" storage box and had bought a few PCGS and a few NGC slabs. The NGC slabs do not fit in the PCGS box (they fit the slots, but the top won't close). Because of that, I began ignoring NGC slabs unless I absolutely couldn't find what I wanted in PCGS. Had I owned an NGC box, that might not have happened. By the way, NGC automatically takes photos of most coins. At this time, PCGS does not.